This article is a guide to ATC-pie, describing some of its major features. A more exhaustive list can be found in the main article. For download and installation help, refer to the ATC-pie installation guide. Anyone motivated to write a full user guide is obviously welcome to contact the developer, or improve this article. For support and troubleshooting, the ATC-pie FAQ might get you an answer first. Otherwise kindly ask on the FlightGear forum, where we have a dedicated sub-forum, so the discussion is public and its contents shared. Whether dematerialised or on physical paper, printed out or filled by hand, the flight progress strip is the essential piece of air and ground traffic control. Every aircraft in contact is represented by a unique strip, and every strip represents a contact. This helps to ensure that no aircraft is ever forgotten about. 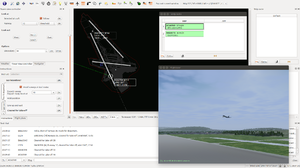 Strip positioning and updating then enable to monitor the aircraft's status, sequence number, position, intentions, etc. A click on the "new strip" tool bar button (shortcut F2) or double-click on an empty rack space will open a dialog to fill flight details on a fresh strip, e.g. destination, type of aircraft, etc. Double-clicking on an existing strip allows to edit the filled details. If providing radar service, strips should be linked to identified contacts to inform the radar display with the filled details and enable joint selection. To link a strip to a radar contact, select one and middle-click on the other. Conflicts between the strip details and the values squawked by the linked transponder contact are reported: the strip displays a "! !XPDR" warning and the strip dialog labels the conflicting details. 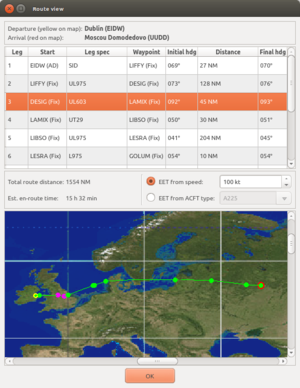 A strip can also be linked to a filed flight plan (FPL) to merge the information. The strip dialog also shows the mismatching information between the two, though this is rather common because the strip typically gets updated as the flight progresses. All together, a selection can involve up to three linked elements: strip, radar contact, flight plan. You can pull details from linked elements to strips (strip panel bottom menu), and push strip details to their linked flight plan if necessary (strip dialog bottom tick box). Unlinking is possible with SHIFT+middle-click. If you use linking carefully, auto-fill options are available from the general settings, to fill blank strip details with newly-linked information. ATC-pie provides with various placeholders for flight strips, namely racks, loose strip bays and runway boxes. According to your ATC position and local facilities, you should choose and arrange your placeholders for optimal control. Strips can then be moved between them using mouse drag and drop. A strip rack is the preferred way of keeping track of a sequence, e.g. a departure queue at a runway threshold. Rack panels can be created from the main window workspace, popped out as separate windows, and a persistent one can be found among the available docks. You can create as many racks as you wish and name them appropriately. Double click on the rack name to edit its properties. Use mouse drag to move strips up and down a rack sequence. A loose strip bay allows free-hand positioning of strips in its reserved space. Such bays are useful for any kind of unsequenced traffic or to map out relative positions when controlling without a radar. You may also import background images, e.g. a ground chart to keep visual track of taxiing aircraft and vehicles. See resources/bg-img/Notice to learn how. A runway box is a placeholder for a single strip, named after a runway and denoting a clearence to use it (enter, cross, land...). Runway boxes are contained in their own dock, and made visible if a corresponding runway is marked in use. Thorough use of runway boxes will help you avoid bad mistakes like clear an aircraft to land over lined up traffic. When freed, runway boxes start and display a timer together with the wake turbulance category of the last contained strip to help with TKOF/LDG separation. What is more, if you use radar, a filled runway box marks the runway as reserved on the scope. a strip shelf (flat button at the bottom of loose and racked strip panels), which clears the strip from your work bench and stores it as shelved. This feature allows you to overlook your airport and the connected or simulated traffic, like a controller from a tower viewpoint. It allows to choose from the tower positions specified in the source data if any, otherwise defaults to somewhere over the airport to allow towering of all available airports. It is disabled in CTR mode. Additionally, more views can be hooked up to your scene. There are two ways of activating a tower view. You may let ATC-pie start its own suitably configured FlightGear process, or have it connect to an external viewer, manually set up and accepting connections. Running internally only requires FlightGear installed on your computer. A basic installation is enough, but you will need the scenery for your airport if you want anything exciting to see (and not sea!). Also, aircraft will only be drawn properly if the appropriate models are available. In multi-player, the models required are those flown by the players. For solo-simulated (AI) traffic and teacher-controlled aircraft, read about icao2fgfs in resources/acft/Notice to understand how ATC-pie chooses models and liveries for its viewers. Aircraft and scenery locations can be filled in the System settings dialog if they are not in your FlightGear root directory. Connecting to an external viewer allows to run FlightGear on a different machine and thereby relieve your session from the CPU load a local instance induces. If you want to do so, get a hint of the required positioning options you should start your viewer with, from the tower view tab in the system settings dialog. Of course, scenery, models and liveries must also be available to the running process. In either case, once activated from the View menu, the tower view control pane is enabled, from which you can turn to runway points, follow selected aircraft... Direct FlightGear input in the view window is also possible: right click and drag allows to look around, x/X keys change the zoom level, etc. You can connect additional viewers to your session, for example placed around your airport for exciting camera footage of challenging landings. You will not be able to control those viewers from ATC-pie like the tower viewer, but you will be able to activate/stop the connection from the View menu. Additional viewers are registered by their host+port address, from the View menu at run-time or from a custom settings file (see settings/Notice), read at start-up and on explicit reload (System menu). TTT is the network polling frequency (100 is common practice; change as desired if you know what you are doing). anticipate route and FL conflicts between controlled aircraft. hold SHIFT and double-click to clear registered vecors from the linked strip. See video 5 of the tutorial for more on vectoring, and check the quick reference display conventions to interpret the lines and colours of the course and vector graphics around radar contacts. NB: In multi-player sessions, an appropriate text chat instruction is suggested for every registered vector. This allows you to send it easily, for example to pilots whose communications are limited to text chat. other tokens are kept as route leg specifications to the following waypoint (e.g. airways between fixes). the current route leg is the last, and the keyword "STAR" appears in its specification: "STAR wp" is displayed, where wp is the last en-route waypoint. NB: If both DEP and ARR airports are not identified, radar tags show the strip destination detail if it is filled, possibly with a heading if it is recognised. See tutorial video 7 for a demonstration of routes. ATC-pie features a conflict prediction system, which can be activated or turned off from the Options menu. It uses route and vector assignments to anticipate and alert you of path conflicts so you can take action and prevent separation losses. 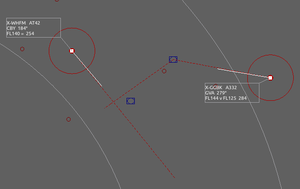 When looking for conflicts, a horizontal (ground projection) path is considered for aircraft with a linked strip and an assigned route or heading. An aircraft is assumed to follow its route, unless a heading vector is given in which case it is assumed to be flying the assigned straight course. When the projections of two aircraft intersect, a conflict is anticipated if the respective intervals between the current and assigned altitudes overlap. When an aircraft's altitude is unknown, the assigned altitude will be assumed. If an altitude assignment is missing, a possible conflict is reported. 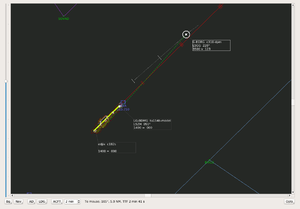 Another possible alarm is the separation incident, a serious ATC mistake which calls for immediate action. The table below summarises the different levels of conflicts, ranked in decreasing order of emergency. 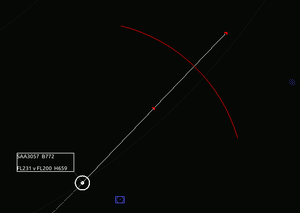 approach (APP), to vector arrivals onto final. When playing CTR, your task is to transit the aircraft across your airspace, always ensuring separation, and to hand each of them over to the most appropriate neighbouring centre North, South, East or West of your sector. You can specify local navpoints in the location settings so that the system includes them as turning points in the randomised aircraft's routes. In airport mode, traffic is either inbound or outbound. Assuming APP, inbound aircraft must be sequenced and vectored into tower range for handover, unless you are in the TWR position as well. Each inbound aircraft either requests ILS or visual. Playing TWR, you must clear them to land when appropriate, i.e. cleared for ILS approach or expected runway reported in sight. If landing cannot take place (too high, not cleared...), aircraft will go around. Controlling GND, you must move inbound traffic near their parking position once they have vacated the runway, and hand them over to the ramp. Outbound traffic must be brought to hold short of a runway threshold and report ready for departure with TWR. If you play DEP, you must hand outbound aircraft over to the en-route centre (CTR) once they are high enough and close to their exit point if specified in its route. Entry and exit points are configurable in the location settings. if the aircraft is connected to CPDLC, you can be prompted to send the instruction through the data link. Instructions from the panel are always issued to the callsign entered in the top field, which should fill automatically on aircraft or strip selection when a callsign is known. Therefore, make sure you do not mess up your strip links or your instructions will realistically be acknowledged and followed by the wrong aircraft. who-has requests, to query the system and know who is claiming contact/control of callsigns. Example of a strip received from "DEL"
To hand a strip over, drag it and drop it on the recipient in the list of connected controllers. Received strips appear on their collecting rack (if defined), with an identification of the sender which disappears as soon as the strip is clicked on. They may link automatically to identified radar contacts, according to the auto-link configuration (general settings). Double-click on the rack name to add an ATC callsign from which to collect strips. See tutorial video 6 for a presentation of the feature. 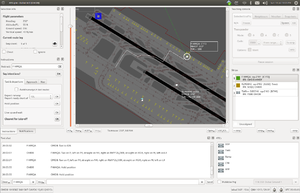 the OpenRadar handover service is OpenRadar's native system, which ATC-pie implements to enable coordination with its users, but some limitations apply (see below). Both systems can be enabled together. If so, ATC-pie will try to choose the most appropriate system through which to send the strips on handovers. 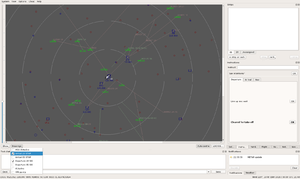 in OpenRadar, a handover must be acknowledged by the receiver for the sender to lose ownership and for all neighbouring users to see it complete, whereas ATC-pie considers that a strip sent is gone and assumed to land on the receiver's rack, without anybody else necessarily to know. when sending to ATC-pie controllers, OpenRadar users will see their transfers acknowledged straight away, unconditionally. pie-to-pie handovers: strip detail preserved, whether present or absent. Detail note: wake turbulance category does not show in OpenRadar, but is preserved and visible to ATC-pie instances later receiving the strip. loose strip bays, to move unracked strips over custom backgrounds, e.g. ground charts of the airport. There are two ways to create backgrounds in the program. One working for all purposes is to import pictures (pixmap files like JPEG or PNG, including transparency); the other works only for radar backgrounds and consists in writing drawing specification files to paint coloured lines and labelled points. This allows to import anything from the most complex coloured height map to the the most schematic airspace outline. The resources/bg-img/Notice file explains how to import and draw background images. 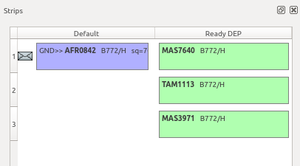 For example, you can map out procedures (SID, STAR, IAD...), grouping them by associated runways. Drawings are generally appropriate for that because they allow referring to named points as per the published procedures and avoid manual positioning. But if you want more than schematic line plots, you should create the picture yourself. Using an image processing tool like GIMP, superimpose a transparent layer on top of a real map canvas, or over a screenshot of your ATC-pie radar with pinned navaids as landmarks, and freely decorate your picture. If you have a VATSIM/IVAO sector file for your area (.sct), the "extract drawings from sector file" option will translate the contained diagrams into ATC-pie drawings. While the generated files always require some filtering and post-editing, it is generally the best option for things like SID/STAR diagrams. Located in the System menu, the "image positioning helper" allows to move and resize imported pictures, adjusting the corners visually rather than programmatically if you have no specification for them. All visible pixmap images will be moved simultaneously, so you can work with several at a time if you want to. On dialog box close, a file is generated in the output directory for you to copy from. 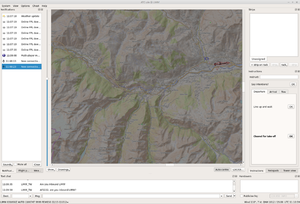 An OpenStreetMap option will take you to the free online map server, centred on your radar centre position. For a quick and dirty start (e.g. for access to coastlines, borders and rivers) you can screenshot the map and use it as a background. The features described in this section do not apply to solo sessions, where text sending is disabled and voice radio interaction is dealt with through speech recognition and synthesis (see the appropriate section above). Multiple radios can be opened and tuned in at once, and you can talk on either one by holding the PTT mouse button down for the chosen radio box. The left-Ctrl keyboard key will also let you PTT on selected frequencies. You can transmit on several at once, for example to service GND+TWR frequencies in view of splitting them seemlessly again if a controller is expected soon to fill one of the two positions. Tick the Kbd PTT option in the radio boxes of the frequencies to merge. Your keyboard PTT key will then transmit on them all simultaneously. Note that while you will be broadcasting on, and hearing incoming transmissions from, all frequencies, pilots will not be hearing each other across frequencies. Say you are TWR coordinating with GND at your airport, and you want to monitor both radio frequencies while you are only in charge of TWR. To set this up, start your radio box on TWR frequency and turn on a second one to monitor GND. Tick "Kbd PTT" only for TWR so that you only transmit to your frequency and don't interfere with the other, and set the volume to "soft" on the latter so that you can tell the radio you are hearing the messages from, and know if it is for you to answer. The PTT turns off sounds option is recommended for those of you who do not wear headsets, as it will avoid GUI sound notifications being picked up by your microphone while transmitting on frequencies. 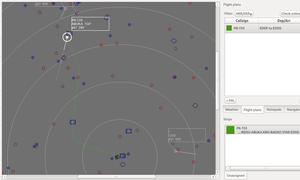 ATC-pie has a powerful text chat system for those who use the keyboard extensively to interact with pilots in multi-player sessions, though of course voice radio communications should be encouraged for realism, whenever possible. First, text aliases are dollar-prefixed words (like $foo) that ATC-pie will try to replace with context-dependant values on message send. This allows to write and save formatted messages and avoid typing verbatim for every message of a recurrent format. For instance, anybody will enjoy the comfort of sending Current weather is $metar, whose alias will expand to the current primary station weather, instead of typing or copy-pasting a weather look-up for every such message. Aliases can be predefined or custom. Predefined aliases take values that are specified by the program, e.g. $metar standing for the current weather, and may depend on the local environment (declination, airport elevation...), on your configuration (transition altitude, runways in use...) or on the current selection (QDM to airport, assigned route...). They are all listed with their meaning in the "quick reference", Text aliases section. Make sure to take a look. individual (selected strip), in your strip comments. If it is one of the predefined list, the substitution is the one described. If not, it is a custom alias and we carry on to the next step. Look for a line beginning with "foo=" in the general notes (notepad dock). If one is found, the alias is substituted with what follows the '=' character. Perform the same search through the local notes. If nothing is found, consider the current selection. If a strip is part of the current selection, look inside the comment field and search likewise. Substitution is unsuccessful. ATC-pie will open an edit box so that you can review your message before sending it. Lastly, if a troll or angry user is polluting your session with undesired messages, add their callsign to the senders blacklist. All messages from the user will then be filtered out from the message pane. You can view and clear this list at any time. The ATC text messaging system allows to talk to other ATCs in channels that are separate from the public one that pilots read. It offers private channels simulating one-to-one landline conversations, and a general ATC chat room in multi-player sessions, readable by all connected ATCs. Note on interoperability: While only ATC-pie integrates ATC-side text chat in its interface, other users can join the same channel with an IRC client. They will be able to send and receive public and private messages and chat with everybody, at the only cost of ignoring the system messages that will sometimes appear on their side. For best results, they should use their FlightGear network callsign as their IRC nickname. This connection type is made to bring an ATC student and a teacher together for tutorial sessions. The teacher creates and manipulates traffic for the student to work with, controls the weather and decides on the ATC neighbours. Strip exchange and ATC text chat is possible, either between both parties ("offline" exchanges) or between the student and the virtual ATCs (in-sim coordination). All exchanges are monitored by the teacher, and transparent to the student. The teacher can also snapshot traffic position situations to recall them later. To set up a session, the student must connect to the teacher, so make sure the teacher's session is running first. Only one student can connect to a teacher at a time. To communicate via voice during the session, the two parties may use nearby FGCom frequencies, but a private channel on Mumble is also an option to avoid interfering with multi-player users sharing the same server. The best choice is probably to tune into unused (guard or secondary) FGCom frequencies for in-simulation transmissions, and to open a separate channel for teacher–student conversations. The teaching console is enabled, which allows you to control most aspects of the environment visible to the student. You create new traffic holding SHIFT down with a right click-and-drag on the radar specifying the position and face heading. 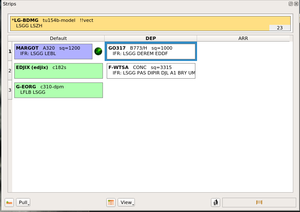 A dialog pops up and allows you to choose a callsign (one is initially generated), altitude and other details. If near a ground route node, a parking position or runway, you can create it on the ground, ready to taxi or for departure (NB: parking overrides position/heading input). Traffic is initially created in an "unspawned" state (round-shaped blip on radar), in other words visible to you but not to the student. This allows you to set its transponder or get it into a certain state before spawning it into the student's world. Controlling the traffic is done in the same way as in solo sessions without voice, i.e. using the click&drag vector and taxi tools and the instruction dock. The only difference is that you control the selected aircraft directly, regardless of your strip links and details. You therefore do not need a strip and a correctly filled callsign to instruct a pilot, though it is a good idea to have one if you want your vectors registered and drawn on the radar. The traffic creation dialog offers to create a linked strip with every new aircraft. You may pause the whole simulation, or freeze each aircraft individually. Frozen aircraft will result in stationary flights on the student's radar. The ATC text chat system allows to simulate landline conversations with the student (select ATC callsign to interact as), or to speak to the student directly as the teacher. To exchange strips, drop them on "Student" and select whom the strip should appear from on the student's side. Note that for your convenience in further control of the traffic, teacher strips do not disappear on handovers. This page was last modified on 1 April 2019, at 04:11.